Nothing screams inconvenience like and oil change. Thankfully, Chevrolet is taking steps with its all new Cruze compact sedan to make oil changes less inconvenient. It’s doing so with a cartridge-style oil filter that’s placed on top of the engine, rather than underneath. The positioning makes for better accessibility to the filter and less (if any) oil dripping when changing the oil. The new cartridges will be featured on the 1.4L turbocharged and 1.8L naturally-aspirated Ecotec engines in the Chevy Cruze. And since the cartridge-style filters are made only of paper and plastic materials, they will also be easier to recycle, compared to conventional canister-style filters that require the metal housing and a rubber seal to be separated from the filter to be properly recycled. This new design, however, eliminates the metal and rubber elements. We have GM’s full presser after the jump! Sorry to bother you, but unpleasant surprise to see that dealers in Romania where I bought the 2011 Chevy Cruze, not sure / ie, where the Ecotec engine product/made 18XR -141bhp, for cars produced in Korea! So, I want to know where they produce this engine for the me Chevy Cruze and the Chevrolet Aveo ? 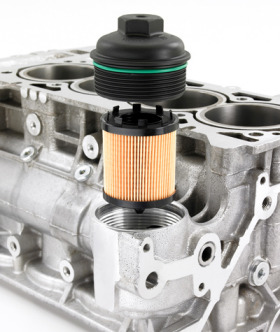 What is the number that describes the Cruze oil filter element (such as PF 25)? What number describes the oil filter element for the Chevrolet Cruze? The 1.4 Ecotec Engine in my Cruze was made in Austria. The filter is an ACDelco PF2257G. It is quite easy to change.